1552-06: When the construction of the dike fort Yarazamori 牙浪沙森 (=屋良座森城) in Naha harbor was completed, a monument was erected with an inscription describing the ancient military organization of Ryūkyū and mentioning Gima Pēchin Shinmō as a military commander (Seitō). 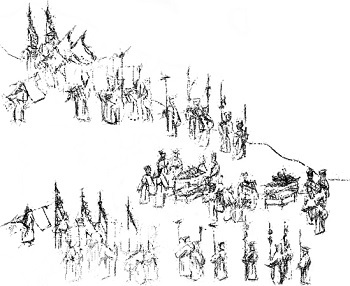 Two years later in 1554, the Ryūkyūan troops received marching orders, with three regiments gathered at their designated places, and repelled attacking pirates. While there is no document to proof so, it may be assumed that Gima Pēchin Shinmō took part in this mission as a military commander, too. The Hiki of old Ryukyu were an organic combination of various government functions: military , overseas trade, ceremony, politics, and religion. I have described the formation and organization of the ancient military organization of Ryūkyū in detail in my book Karate 1.0, including important parts of the text of the Yarazamori monument. This description is valuable and indispensable to understand the circumstances in which ancient martial arts of Ryūkyū were implemented. Seitō, Chikudun, Kerai akukabe, and Chikusaji are some of the important designations of warriors of old Ryūkyū. 沖縄の歴史情報　第５巻。画像と全文テキストデータベース (Ⅰ）。 (6)「琉球家譜」の情報化。①首里系家譜。麻姓家譜 (田名家）. Takara Kurayoshi: King and Priestess. Spiritual and Political Power in Ancient Ryukyu. In: The Ryukyuanist. The International Society for Ryukyuan Studies. Newsletter No. 27. Winter 1994-95: 3. Quast, Andreas: Karate 1.0. Düsseldorf, 2013. This entry was posted in The Genealogies of the Various Houses of the Ma-clan and tagged Chikudun, chikusaji, KARATE 1.0, Kerai akukabe, Seito, Yarazamori. Bookmark the permalink.